We offer a wide range of fibre optic signal conditioners for OpSens fibre optic sensors to suit various requirements and industries. To see how we can help implement fibre optic technology into your application please contact one of our technical sales engineers. 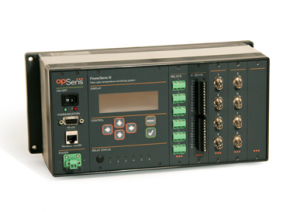 High reliability, multi-purpose single channel signal conditioner for all OpSens WLPI fibre optic sensors. 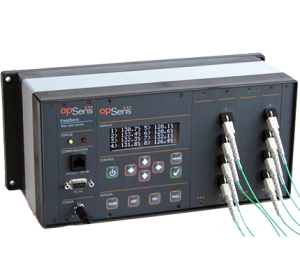 High reliability, multi-purpose, multi-channel signal conditioner for all OpSens WLPI fibre optic sensors in a desktop enclosure for laboratory and research use. Available in 4 or 8 channel model. 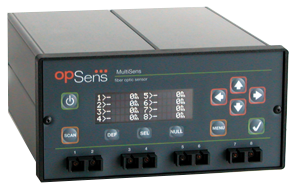 High reliability, multi-purpose, multi-channel signal conditioner for all OpSens WLPI fibre optic sensors in a mountable enclosure for field applications. Available up to 16 channels. 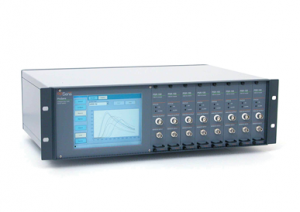 High sampling rate signal conditioner for dynamic measurement. Modular system in a rack mount enclosure for up to 1KHz sample rate per channel. 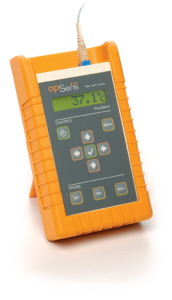 SCBG signal conditioners are used for the measurement of temperature with OpSens SCBG sensors. This is also known as GaAS or GA technology for the use of Gallium Arsenide as the crystal inside the sensor. No gauge factor entry, a true simple user interface system. Single channel temperature signal conditioner. 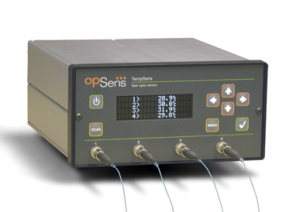 The TempSens is a multi-channel and easy to operate signal conditioner that is used with any of OpSens’ GaAs-based fibre optic temperature sensors. 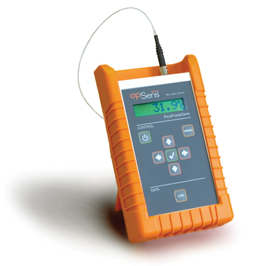 The TempMonitor is a multi-channel and easy to operate signal conditioner that is used with any of OpSens’ GaAs-based (SCBG) fibre optic temperature sensors. A range of OEM boards are available for integration in to host systems for large scale deployments. For further information please contact one of our technical sales engineers to discuss your application.